Leche Flan with whole eggs made easy with a simple hack on how to caramelize sugar in the microwave. It uses whole eggs, not just yolks, so there’s no waste! I know I promised you my delicious take on burger steak as the follow-up recipe to the absolutely amazing slab of crispy pork shoulder I posted a few days ago. However, today, April 2nd, marks the one year anniversary of my quitting my day job and taking the leap to full-time blogging so I thought I’d revisit and share another version of the top recipe on the blog, Leche Flan, instead. If you’ve read the post, you know this classic Filipino dessert holds my tale of love and loss. Don’t worry; I am not going to go off on a tangent here and get sappy on you as this aforementioned personal tale of love and loss no longer matters. 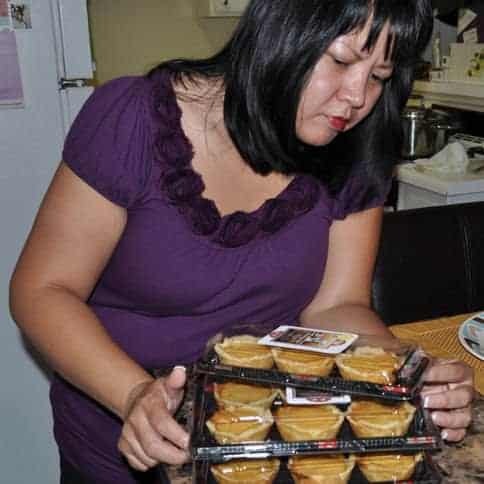 Learning how to make leche flan was not only instrumental to my healing but was also fundamental to my blog’s growth into a viable business. Almost four years since I posted the caramel custard, it continues to be in the top ten most visited recipes on Kawaling Pinoy with over 1,000,000 views! It is special to me for many reasons, and I am glad you love it as much as I do. Although my original flan recipe is indeed the smoothest, creamiest, and most melt-in-your-mouth you’ll find, it has ONE major drawback. What to do with the egg whites? 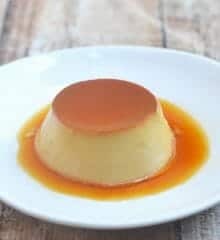 This new recipe is the simplest method to make flan using a super easy way to make caramel in the microwave. Plus, it uses whole eggs, not just yolks, so there’s no need to waste egg whites! 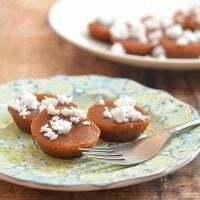 As the sugar is not melted over the stove top and is caramelized in the microwave instead, you can use ceramic or glass ramekins to steam or bake the flan. Microwave wattages vary so adjust the time accordingly. Add half minute increments as needed until the caramel reaches a honey gold color. Please note that sugar can burn fast in the microwave so keep a close eye especially when the liquid starts to brown. You can read more of my tips on how to caramelize sugar in the microwave. Although you can easily blend the eggs and the milk in a blender, I prefer mixing everything by hand. Just make sure to whisk the eggs first until there no more streaks of white before you add the milk as I find the eggs are harder to whisk when swimming in liquid. The secret to super smooth leche flan is straining the mixture using a fine mesh sieve or cheesecloth. If there are a lot of bubbles in the mixture, allow the mixture to stand for a few minutes for the bubbles to subside. 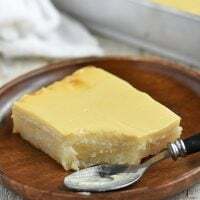 You can steam the leche flan if you like but my preferred technique is baking it in the oven using a bain marie or water bath. Add water halfway of the molds to keep the water from seeping inside. I used 1-cup ramekins to make the flan but you can use three 2-cup size llaneras if you like. Make sure to adjust cook times and check for doneness by inserting a toothpick in the center of the flan. If it comes out clean, the flan is ready to cool. To easily remove the flan from the ramekin, run a knife around the edges to loosen, invert on a plate, and gently tap all around the ramekin to release the flan. Allow the custard to completely cool. 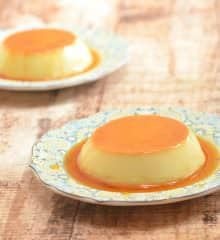 This whole eggs leche flan is just as smooth and creamy in texture as flan made with yolks, but because it uses whole eggs, it is not as rich in taste. As you can see, it’s also paler in color. Which of the two versions is better is a matter of preference. Want other flan flavors? Check the list below! 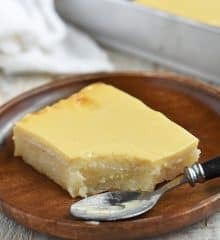 Cream Cheese Flan-it’s like having flan and cheesecake in one bite! 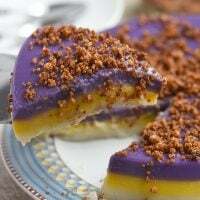 Leche Puto-can’t choose between puto and flan? Now you don’t have to! Coffee Flan-a delicious way to get your caffeine fix! Watch the Video in the Recipe Card and see how easy it is to make Leche Flan using whole eggs. Leche Flan with whole eggs made easy with a simple hack on how to caramelize sugar in the microwave. It uses whole eggs, not just yolks, so there's no waste! In a clear, microwave-safe bowl, combine water and sugar. Stir well under sugar is completely dissolved. Microwave on high for about 4 to 5 minutes or until color changes to honey-gold. Immediately pour into the ramekins or llaneras. In a bowl, gently whisk eggs until there are no streaks of white. Add condensed milk and stir until combined. Add evaporated milk and stir until well-combined. Add lime zest and stir. Using a fine mesh sieve or cheesecloth, strain mixture. Pour into prepared ramekins. Cover ramekins with foil and arrange in a wide, oven-safe dish with about 1-inch of water (water bath). Bake in a 375 F oven for about 40 to 50 minutes or until a toothpick inserted in the middle of custard comes out clean. Remove from oven, allow to cool and refrigerate to set. To serve, turn flan over on a serving plate, ending with caramel on top. Other than straining, I think gently steaming helps as well. I find I have better/smoother results using a bain marie or water bath in the oven than steaming over stove top because the heat is more consistent. Thank you!!!!! I just didn’t put lemon zest and use vanilla extract instead. And I failed when I tried to microwave the sugar because I put it in such a small bowl and it exploded. Thank you, Mercy, for the feedback. I am glad you enjoyed the flan. I usually take the caramel off the heat when it’s a shade lighter than the color I like because it continues to cook in the residual heat. Congratulations for making that leap from a full-time job to blogging. Wish I could do the same. I just cane across your blog as I was looking for a leche flan recipe for Easter and I must say I am impressed! It’s well-written, not your usual boring, “de cajon” recipe blog with a unique calorie list I don’t see in other sites. Keep up the good work! Tried baking it,was too dry for my taste. I tried steaming some too,steaming came out better. Thank you for letting me know, I forgot to add the lime zest in the instructions. 🙁 Already corrected! Instead of evap pwede po table cream ang gamitin? I’ve never tried this with table cream so I am not sure kung ano ang resulta. Table cream is bit thicker and richer so I am guessing the substitution will affect the texture and taste of the flan. Yes, pwede siya steam. I would guess mga 40 minutes siguro. 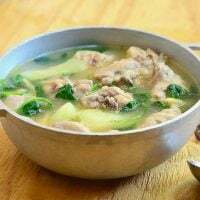 Tusukin lang po with toothpick sa gitna to make sure kung luto na, dapat malinis yung toothpick. Enjoy! I tried your whole egg leche flan, steam ang ginawa ko for 30mins, butas butas sya. Masarap nman pero hindi smooth na katulad ng puro yolk lng. How po? Thank you. Make sure to strain the mixture well using a cheesecloth at wag masyadong malakas ang apoy pag steam. Ako kasi I like to cook the flan in the oven using a bain marie para controlled ang init.